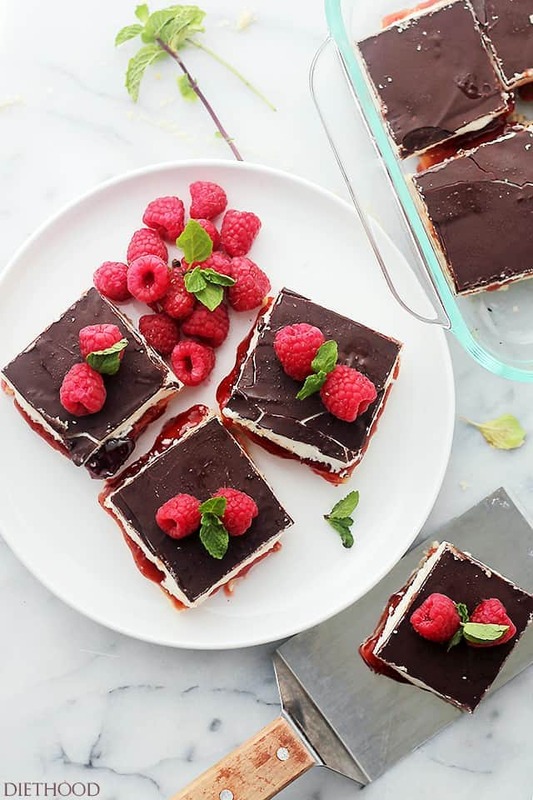 Shortbread Raspberry Cheesecake Bars – Sweet layer of shortbread crust topped with raspberry jam and a creamy white chocolate cheesecake mixture. Totally amazing!! This?! Ohhhhh, this. 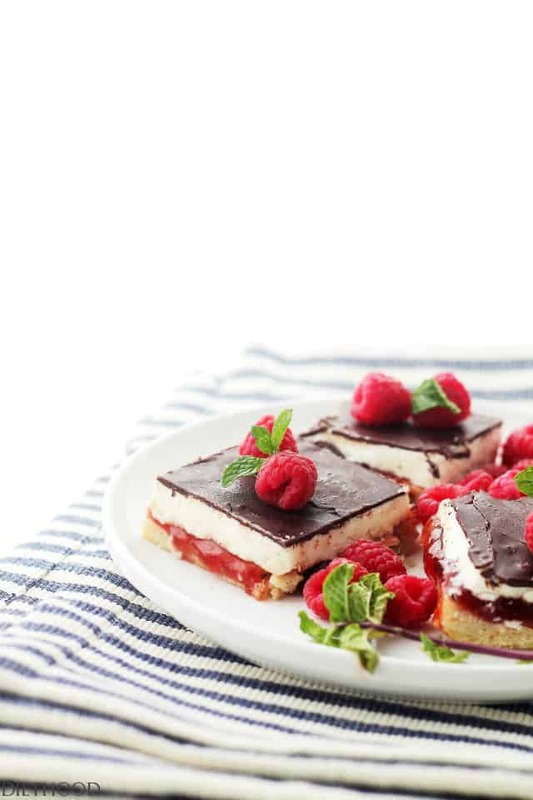 This is possibly the easiest cheesecake-bars-dessert of ever. Also known as the dessert that I would walk 500 miles and I would walk 500 more. (on the treadmill) Just to be the woman who walked a thousand miles just to eat the cheesecake that I truly adoooooore. Oh hey! Well Hi there! What’s going on, pals? I’m sort of interrupting our regularly scheduled program for something pretty and something creamy. You with me?! Alllrighty then! (<— I always think of Jim Carrey when I say that). …Ace Ventura? Pet Detective?? You DO know what I’m talking about, right? Soooo. Today is a fun day! Today we are talking dessert! I thought this would be a good day for such a discussion since lovah’s day is quickly approaching and all. Are you expecting chocolates, jewelry, or a tropical vacay?!? To be honest, I am hoping for a new car. I know that’s too much to ask for on this “holiday”, but Santa forgot to bring it to me, so now my money is on Cupid. Let’s see if that arrow can really work it. Also? There’s just something about chocolate and cheesecake and berries. It’s just straight up good. Right? By the way, this is just another one of my cop-out cheesecake recipes. I kind of don’t like making those baked cheesecakes, you know? AND I certainly hate pulling it out of the oven only to find a cracked crust. Ew. You don’t even have to taste it to know that you failed it. Ain’t nobody got time for that. For that reason, mixing cream cheese and white chocolate is kind of the next best thing! I’m pretty sure it’s not the best thing, but let’s just go with that, m’kay? 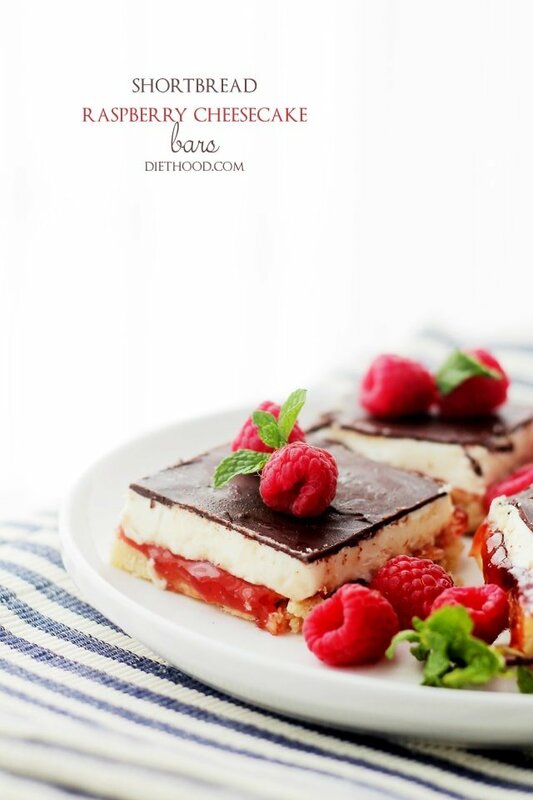 These cheesecake bars are super easy, amazing, too, and yes – almost no-bake. Gotta bake the crust. BUT that’s all! The rest is no bake. 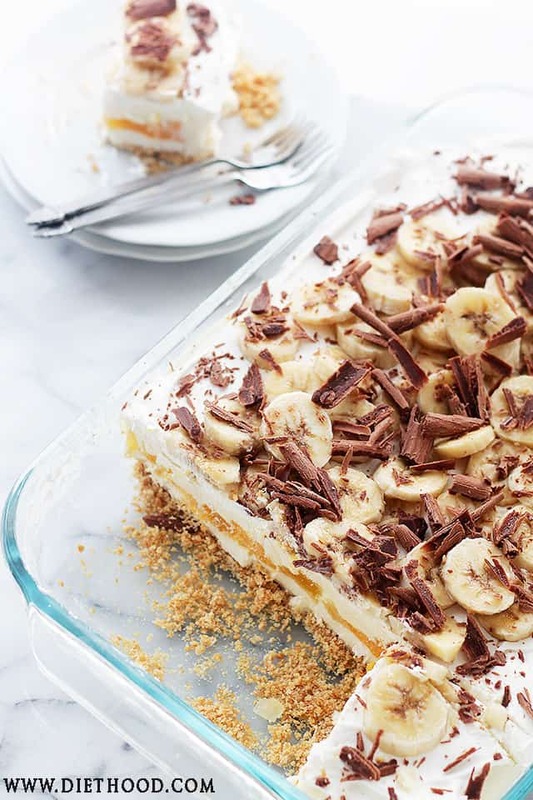 Just layer after delicious layer of no-bake goodies. It’s like they are begging you to make them. AND eat them. Sweet layer of shortbread crust topped with raspberry jam and a creamy white-chocolate cheesecake mixture. Line an 9x9 pan with aluminum foil, leaving about a 2-inch overhang on opposite sides. Lightly grease with cooking spray and set aside. Combine flour and powdered sugar in a small mixing bowl; whisk until combined. Using a pastry cutter, cut in the butter. You can also use a fork or two knives. Work the butter for about 2 minutes, or until thoroughly combined. Press the mixture on the bottom of prepared pan. Bake for 15 to 16 minutes, or until golden brown. Remove from oven and let cool 10 minutes. 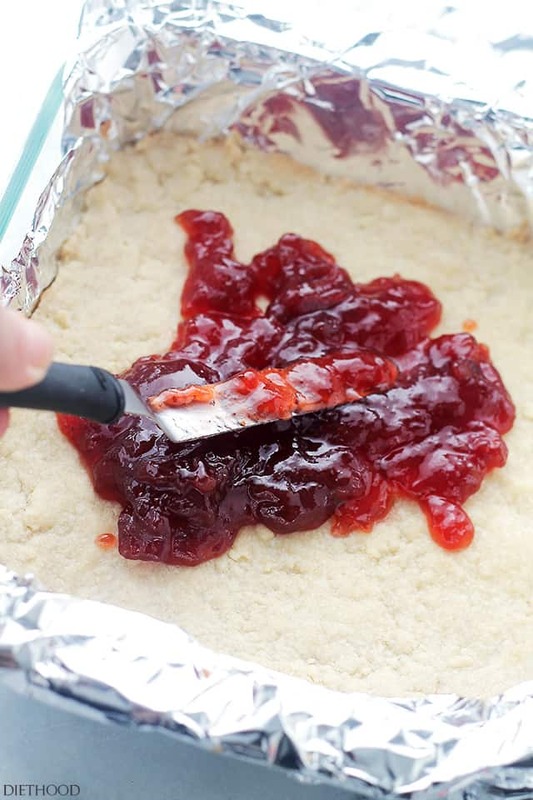 Spread raspberry jam over crust and set aside. In your mixer's bowl, combine cream cheese, milk and vanilla; beat for 3 minutes, or until mixture is creamy and smooth. In the meantime, combine white chocolate chips and 1 tablespoon vegetable oil in a small microwaveable bowl. Melt in microwave for 1 minute. Stir and melt for an additional 30 seconds. Remove from microwave and let cool for a few minutes. Add melted white chocolate to the cream cheese mixture; beat the mixture for 1 minute, or until completely incorporated. 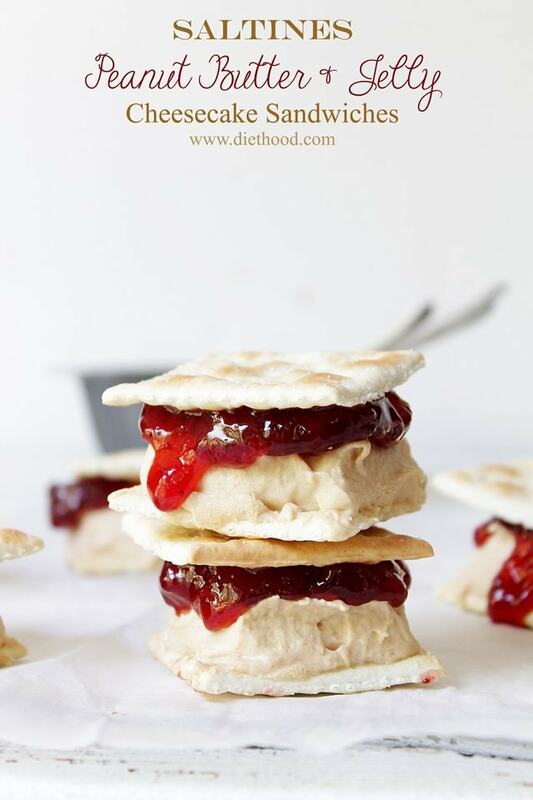 Pour cream cheese mixture over jam and spread evenly using an offset spatula. Combine dark chocolate chips and 1 tablespoon vegetable oil in a small microwaveable bowl. Remove from microwave and spread over white chocolate layer. Refrigerate for 4 hours or overnight is best. Cut into bars and serve immediately. Lovely dessert! Great flavors and beautiful pictures! Pinned! Shortbread as a crust? Well doesn’t that just sound lovely. If Cupid brings you a car, please send him in my direction! These look awesome! All my favorites in one bar! 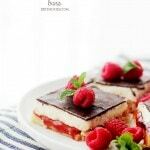 I am loving that you made a white chocolate no-bake cheesecake! Easy to make and easy to devour! Yes, it was way too easy to devour!! 🙂 Thank you, Christina! These look too pretty to eat. I love the pictures, it makes me want to lick my computer screen. Haha, good thing I’m a germaphob! Thanks so much for sharing! 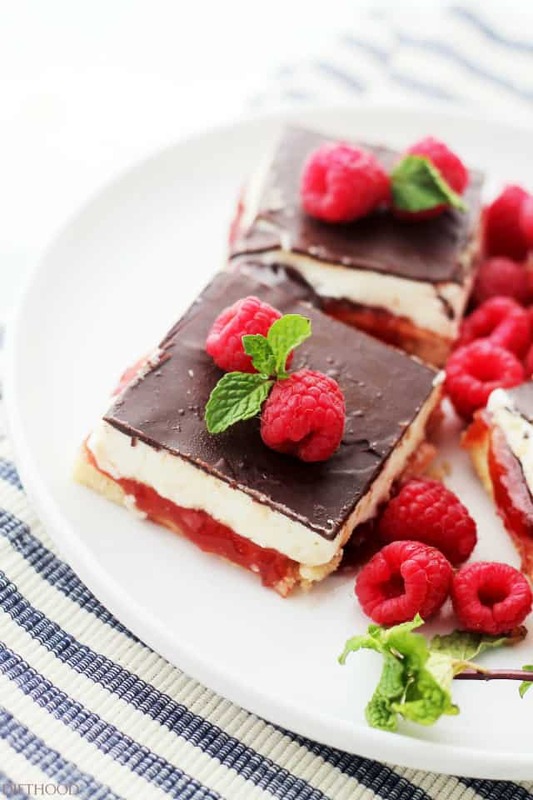 I’m dying over all the insanely delicious looking desserts floating around the web today! These guys look nothing short of spectacular!